Members of this community of Light (all people) are invited to this month’s Awakening class to receive special blessings of the hands. 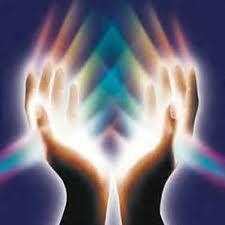 This month the angels are showing me the palms of our hands being awakened to new healing powers. This is not to be confused with receiving attunement to Reiki or any other form of healing, but rather an energetic attunement to awaken the hands to sense , feel and know their power, that they are the way showers. What you do with your hands, what activities you perform are all performed from a place of awakened awareness,and so we will be teaching you and showing you how to awaken your potential to create with these hands and to heal with these hands and to instruct and repair with these hands, how to sow and reap with these hands. We are awakening your potential to create through actions. Archangels Chamuel, Raziel and Chiron* will be here. *Chiron is a comet with a unique and erratic orbit. In the natal chart, Chiron is symbolized by the “wounded healer”. It represents our deepest wound, and our efforts to heal the wound. Chiron was named after the centaur in Greek mythology who was a healer and teacher who, ironically, could not heal himself. Bring water, your notebook and pen, and a sacred healing crystal to charge with your blessings for the hands so that all you undertake is protected and guided.